Canada’s UNESCO World Heritage Sites souvenir sheet includes perforated stamps with moisture-activated gum. A 10-stamp booklet of Canada’s new UNESCO World Heritage Sites definitive stamps. One of two new definitive stamps adapted from larger $1.20 UNESCO World Heritage Site commemoratives issued in 2016, this permanent-rate stamp depicts Labrador’s Red Bay Whaling Station, where Basque fishermen from Europe hunted and rendered whales from 1530 to 1600. The most recent UNESCO World Heritage site in Canada, Mistaken Point at the southeastern edge of Newfoundland is home to the world’s oldest identified communities of large fossils, dating back 580 million years. Located at the northernmost tip of Newfoundland, L’Anse aux Meadows is the remnant of an 11th-century Viking settlement, dating from the earliest known European presence in North America. Founded by French explorer Samuel de Champlain in 1608, the Historic District of Old Quebec City is a rare surviving example of a fortified colonial town of New France. It is probably the best-known of the UNESCO World Heritage sites featured on the five Canadian definitives issued Jan. 16. 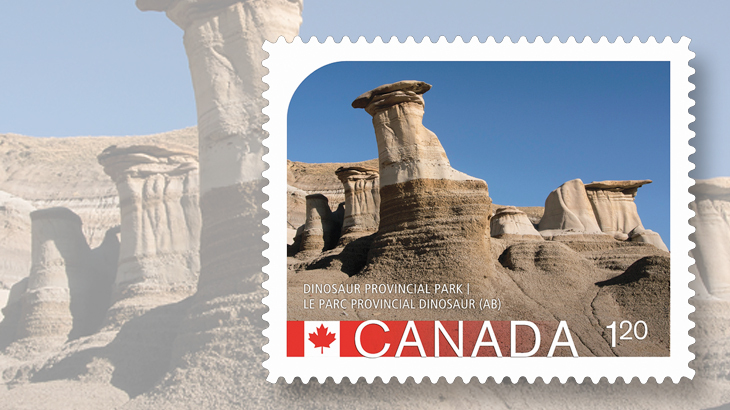 The last stamp in Canada’s UNESCO World Heritage sites saga is this permanent-rate definitive version of the revised and corrected stamp design introduced for Dinosaur Provincial Park, Alberta. The revised stamp was issued Aug. 21, 2015, to replace an earlier $1.20 commemorative with an incorrect image that had been issued July 3 and was swiftly withdrawn. “UNESCO, World Heritage in Canada” and “Canada 150” logos, as well as the Canadian flag, are all visible under ultraviolet light in the tagged margins above each stamp in this enlargement of a booklet photographed under ultraviolet light. On Jan. 16, Canada Post issued the final installment in its series of stamps depicting UNESCO World Heritage Sites in Canada. The set includes five “P” permanent domestic letter-rate stamps (currently 85¢) in die-cut 10- and 30-stamp self-adhesive booklets and a five-stamp perforated and moisture-activated souvenir sheet. These World Heritage sites, of which Canada has 18, are designated by the United Nations Educational, Scientific and Cultural Organization to single them out for preservation as places of outstanding cultural, natural and historic importance. Newly depicted on this year’s issue are the celebrated Historic District of Old Quebec City, Quebec; and two sites in Newfoundland, L’Anse aux Meadows National Historic Site and Mistaken Point. As was the case with the UNESCO Heritage Sites stamps issued by Canada Jan. 11, 2016, the new set sees the return of two previously used large $1.20 commemorative designs downsized for definitive use at the permanent rate. These depict the Red Bay Basque Whaling Station in Labrador and the revised and corrected stamp design for Dinosaur Provincial Park in Alberta. The latter (Scott 2857-2858) was issued Aug. 21, 2015, to replace the $1.20 Dinosaur Provincial Park stamp with an incorrectly identified image that had been issued July 3 (2844, 2847a) and swiftly withdrawn. Hoodoo Snafu: Canada to scrap and replace $1.20 Dinosaur Park in UNESCO Heritage Site issue: One of five new stamps celebrating UNESCO World Heritage Sites was found to have the wrong image. UNESCO sites stamps issued as definitives last year and now in January 2017 have no such luxury. Instead, they use microprinting that can be hard to see even under a magnifier to name the historic sites shown, in both of Canada’s official languages. It’s not a perfect solution, but it may make you glad to have a magnifying glass. The Historic District of Old Quebec City is familiar to the throngs of tourists who have visited the heart of Canada’s oldest provincial capital, founded by French explorer Samuel de Champlain in 1608. It is a rare surviving example of a fortified colonial town of New France. Situated at the tip of Newfoundland’s Great Northern Peninsula, L’Anse aux Meadows is an archaeological site that held the remnants of an 11th-century Viking settlement of timber-framed turf buildings similar to those from contemporaneous sites in Norse Greenland and Iceland, clear evidence of the earliest European presence in North America. Located at the extreme southeastern corner of the island, Mistaken Point was dedicated in 2016 as Canada’s newest UNESCO World Heritage Site, named for the hazards of navigation that have claimed more than 50 ships over the centuries. Its significance, however, dates back some 580 million years, as its rugged coast displays the world’s oldest identified communities of large fossils, the first such sizable, complex organisms known on Earth. Beginning in 1530, Basque sailors at the Red Bay Whaling Station spent summers hunting bowhead and right whales that once teemed in the Strait of Belle Isle between Labrador and Newfoundland. The extensive site was a base for coastal hunting, butchering, rendering of whale fat by heating and storage of valuable whale oil, which was shipped to Europe. 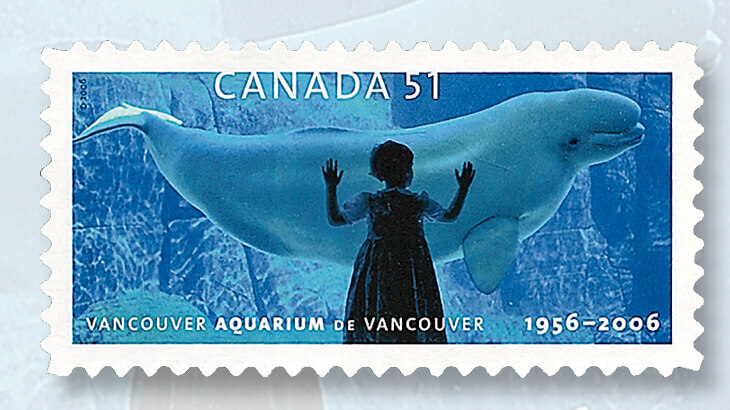 A larger $1.20 commemorative version of this stamp was issued July 3, 2015, (Scott 2847), paying the basic Canadian letter-rate to the United States. Inscribed on the UNESCO World Heritage list in 1979, Dinosaur Provisional Park “contains some of the most important fossil discoveries ever made from the ‘Age of Reptiles’, in particular about 35 species of dinosaur, dating back some 75 million years,” according to UNESCO. 10 of Canada Post’s most outstanding stamps of the last 10 years: Fred Baumann highlights one Canadian issue for each year of the past decade that is outstanding in one way or another — stamps that merit a look back. As definitives, the booklet versions of these stamps have no fixed print runs. All are printed in four-color offset lithography by Canadian Bank Note. “UNESCO, World Heritage in Canada” and “Canada 150” logos, as well as the Canadian flag, are all visible under ultraviolet light in the tagged margin above each stamp. The 10-stamp booklet, Canada Post order number 111231, contains two of each stamp design, while the 30-stamp booklet, 111232, contains six of each. The stamps also were produced in a five-stamp souvenir sheet, order number 411231145, of which 100,000 were printed. The souvenir sheet measures 130 millimeters by 71mm, and the stamps are 24mm by 20mm. Also available are 8,000 souvenir sheet official first-day covers canceled in Trepassey, Newfoundland, a fishing port near Mistaken Point, 411231144, price $5.25, and five prepaid international-rate picture postal cards, selling for $2.50 each. Lara Minja, of Lime Design based in Victoria, British Columbia, created the stamp designs. As on the first UNESCO World Heritage Sites stamps issued by Canada in 2014, these booklet stamps are self-adhesive and die-cut to simulate perforations, and the souvenir sheets have moisture-activated gum and conventional perforations. These stamps and related items are available here. Stamps and FDCs are available by mail order from Canada Post Customer Service, Box 90022, 2701 Riverside Drive, Ottawa, ON K1V 1J8 Canada; or by telephone from the United States or Canada at 800-565-4362, and from other countries at 902-863-6550.